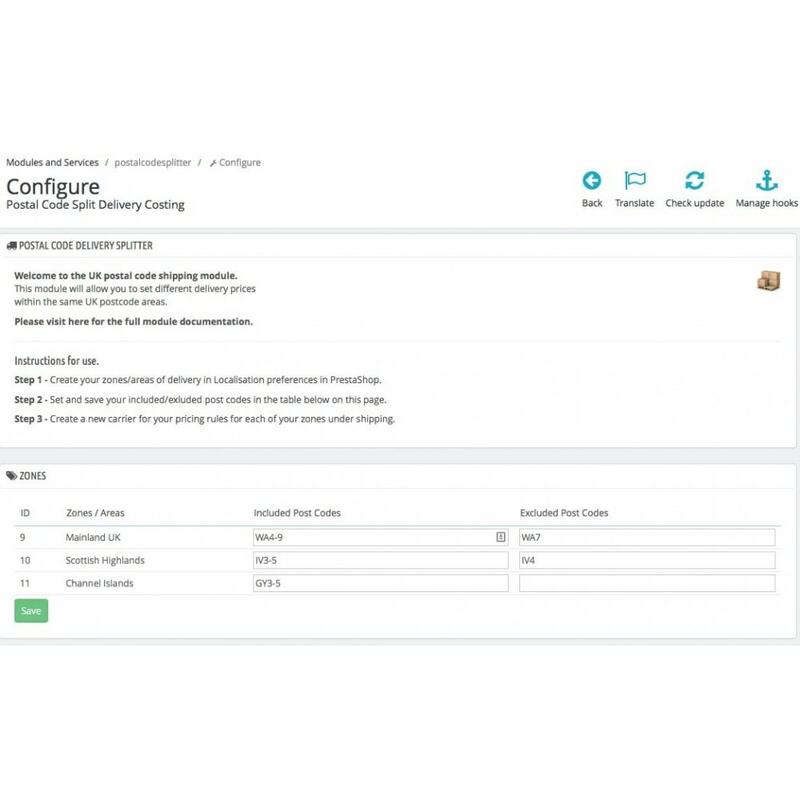 This module allows the merchant to create different zones according to UK postcodes in order to set different rates of delivery within the same zone, split by postcode. 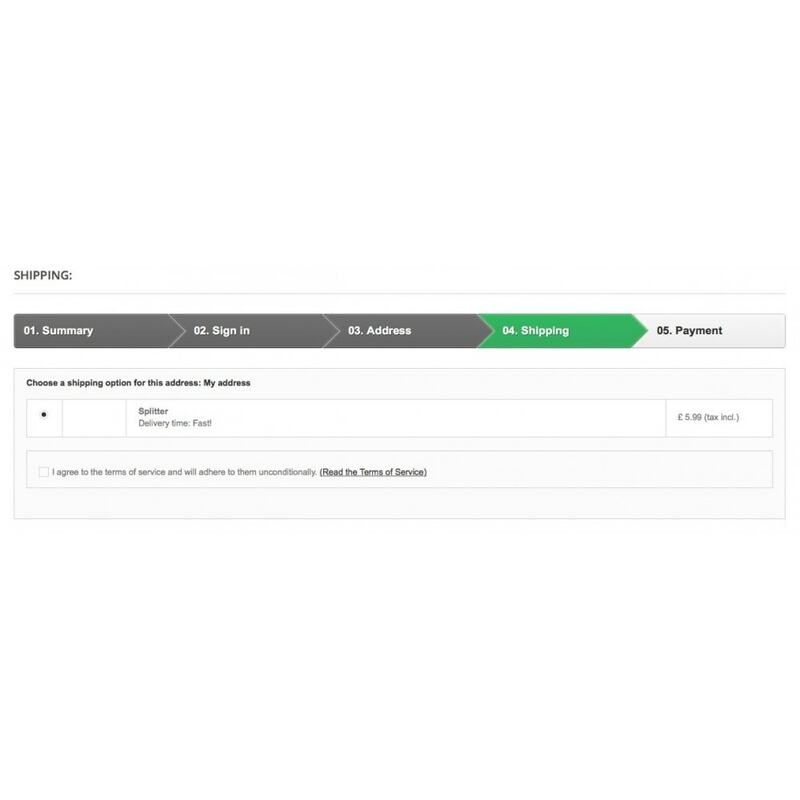 Allows the merchant to set different rates of delivery within the same zone, split by postal code. This is highly useful for merchants that have delivery zone restrictions in the UK (Scottish Highlands/Islands as an example). 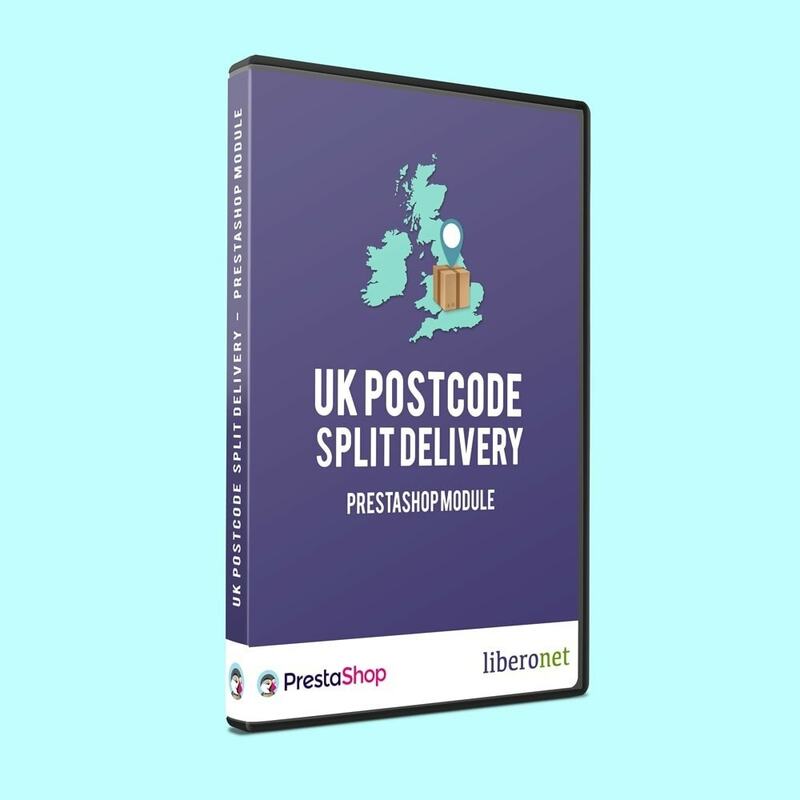 Splitting the delivery by postcode you are able to provide better prices in delivery rates so your costumers will benefit from adjusted prices on their orders that will let you sell more because you are able to offer better prices in your shop. Please note module only works with the one carrier that is installed upon module installation. Does this module allow us to configure different zones within mainland UK so we can offer different shipping prices for different areas of the UK? Yes, With our module you can configure different areas in the UK. 2. Do we have to input all excluded post codes that we do not deliver to in the entire of the UK? You do need to add them, if you don't deliver to that post code area otherwise you won't be disabling it, it would charge the standard rate. 3. I have created a new zone and it's showing 'Free delivery', why is it not working? You need to add the delivery rate for your zone and activate the carrier, otherwise it won't work. Please activate the carrier called 'POSTAL CODE DELIVERY SPLITTER CARRIER' and define the delivery charges for this carrier for your desired zone. 4. I'm having issues integrating your module with a different module, what's happening? 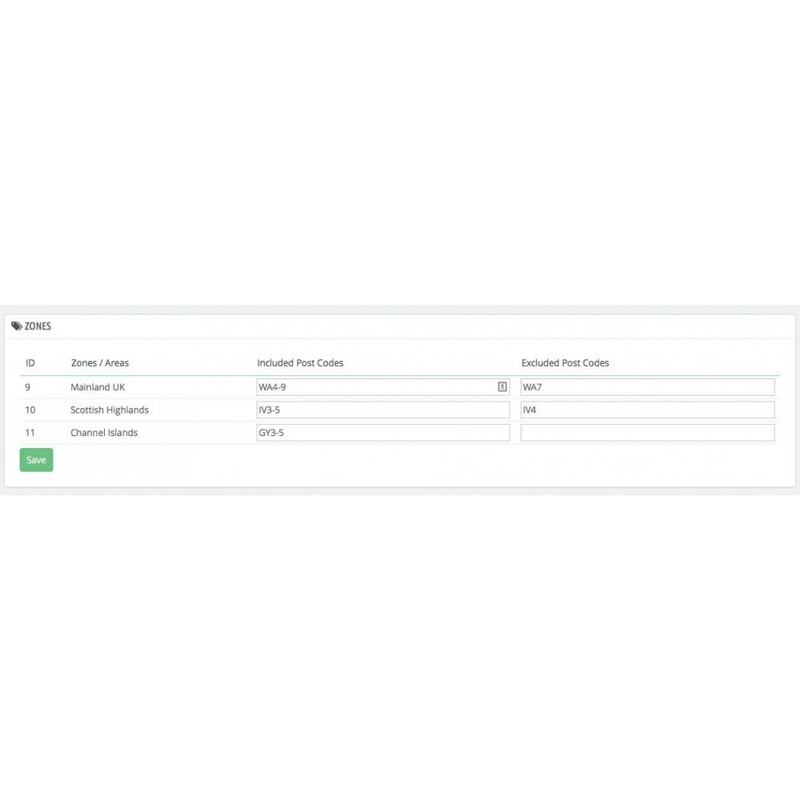 Our module works with an override for the Cart and Carrier controllers to modify the shipping costs dependent on the module settings. If the other module is using the same controller to achieve the results required for their module, this will be causing a conflict with our Postal Code Splitter. 5. Does this module work with shipping costs based on weight? The module will calculate the delivery charge for each postcode using the "According to total price" option and not the "According to total weight"
Provides a shipping method suitable to your customers, whatever their UK postal code may be. Providing different shipping methods your customers will benefit from better prices in their orders. Please check that cURL is available and activated on your hosting environment. (This is needed for the postal code validation service). Requires PHP 5.4 or higher. Documentation provided that covers installation and configuration of the module.